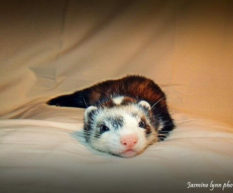 This is Ferret Of The Month November 2009! 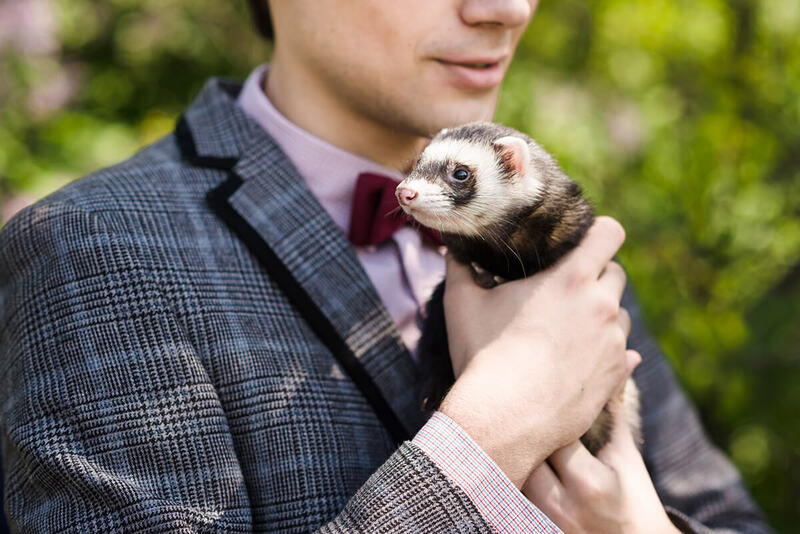 This is a wonderful ferret, wonderful owner and wonderful story…thank you Joe for sharing this with us! Orphie came to me and my ex-girlfriend just over five years ago, when he was one. We took him in from a rescue centre soon after he had been neutred. Consequently he was still golden. We had looked after one before called Isis so thought a gods’ name would be good for a little creature with a massive presence. We choose Orpheus as he is one of the few who were able to come and go from the underworld. It seemed natural to shorten it to Orphie. He rarely comes when called by name but does come if whistled at, unless he is engrossed with an important project. By the time we had treated him for an infestation of ear mites he had picked up at the rescue centre (centre staff insisted that the blood coming from his ears and inflamation was caused by ‘fighting’) he was as comfortable with us as we were adoring of him. I used to work nights back then and he used to wait with his nose poked under the door for half an hour after I left. He also used to celebrate each morning and each time we came home with a dance of joy. 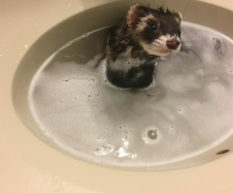 There is nothing like coming home from a party at 5am and being greeted by a happy ferret. 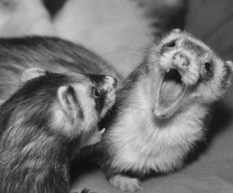 People without much experience of ferrets look at you strangely when you tell them how fascinated ferrets are by humans (and everything else) and how they take it upon themselves to look after you. Their natural curiosity extends to observing humans. 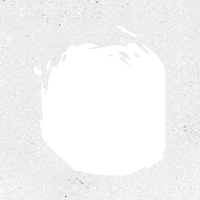 He very often fights sleep to gaze at people, sometimes ‘hidden’ with just his nose visible – especially with guests. Being afraid of baths and showers himself he used to always find a way to monitor us when bathing or showering, including getting on top of the backs of chairs to peer through cracks in doors or if doors are closed listening intently right outside. Sadly his energy levels have gone down now but he still takes a massive interest in people. Guests are treated to a dance, as are new carrier bags – which he sleeps in, jumps on and hides food in. This April he started to cough a lot, sometimes for over ten minutes. 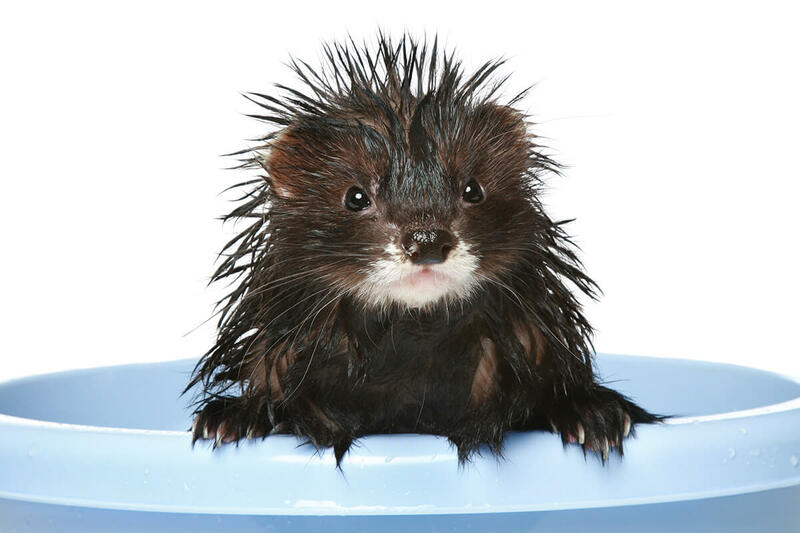 Ferrets don’t do things by halves and he used to put such energy into coughing that he would be exhausted. It must have been painful too. After a few days we got him x-rayed and then he had an ultrasound, which confirmed he had cardiomyopathy – in his case leaking from the bicuspid and tricuspid valves. A blood test also revealed Orphie has kidney damage. He tolerated all the testing well and used to sleep in the scales at the vets whenever she stopped to input information on the computer. It’s been six months now since he started on an ACE inhibitor to deal with his heart disease and the coughing fits have been kept at bay on the whole. His breathing rate is back to normal but goes up when there has been a change, especially when being looked after elsewhere when I’m away. He’s still loving his food, loving head rubs and more cuddly than ever. 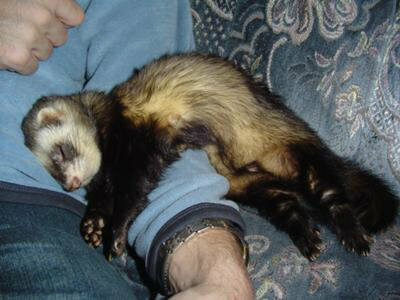 He sleeps more but ferrets are expert sleepers so he knows what he’s doing there. His fascination with life seems to stir him on. He still knows everyones’ patterns and fits in around them. The most likely time of him dancing now is when he sees shoes go on in the mornings. This appears to be a cunning attempt to distract us from leaving. It can be very hard to leave him. They are a pack animal and it seems important to them to know all about all the humans and other creatures around them. 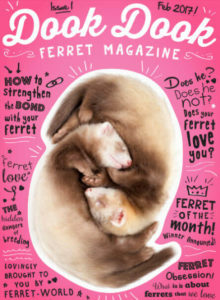 It’s a privilege knowing ferrets, they are still misunderstood but are a never ending source of delight and wonder for anyone who spends time getting to know them. They are a great link to the natural world as their inquisitive nature embodies the spirit of the universe – the endless quest for something new just around the corner and the need to know whats under every stone and fallen leaf.